Happy New Year you lovely lot! How’s it going so far? I’ve made some simple resolutions this year (blogged here, if you’re interested), but one more specific challenge I’ve set myself is to MAKE more stuff. It’s easy sometimes to get bogged down with admin, with tweaking and twiddling my online store, and of course with the daily running around and picking up after the smalls. I realised after Christmas I hadn’t done nearly enough crafting, and that had to stop. Or start. Whichever. So I’ve put a fancy-pants app on my fancy-pants phone, which means I can tick off every day I do something crafty – which should of course be EVERY day. 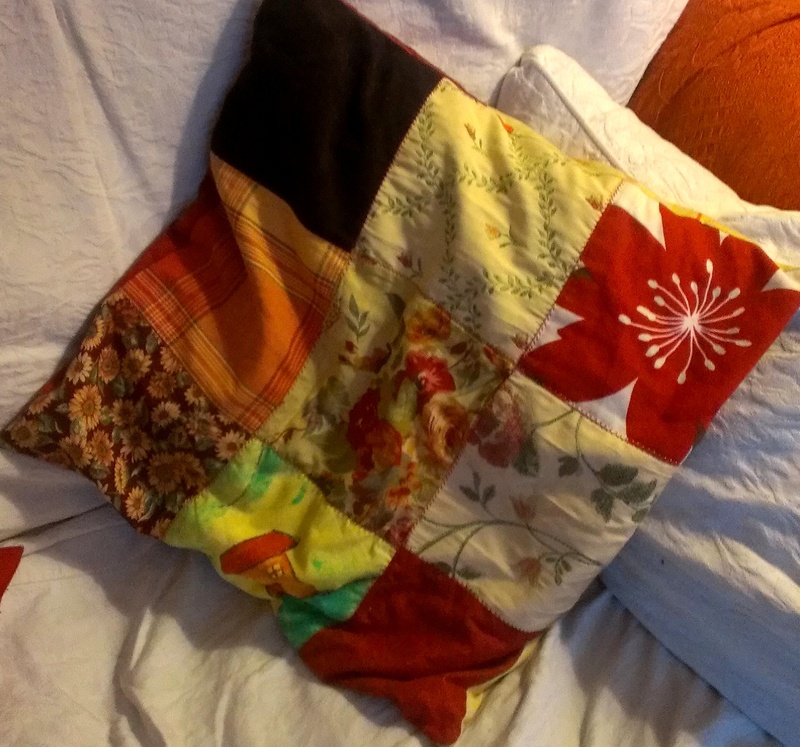 Thus far, it seems to be working, and even that naggy voice in my head which keeps telling me I need to pay the gas bill, or do all the ironing, or tidy R’s room because she is *never* going to do it herself – even that little voice has to wait until I’ve nurtured my creative mojo. 1) Finally put the buttons on a cushion cover I made ages ago, so it can now function as a real actual cushion, on our real actual sofa. 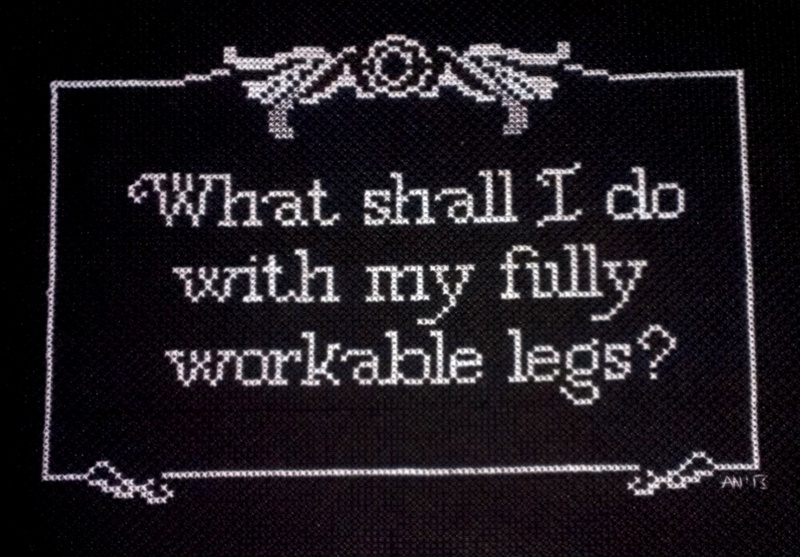 2) Completed a custom cross-stitch for my oldest friend. 3) Made some beautiful felt bird bunting for another friend, who was 23 on the 23rd January (a cool fact she and I thought more people should be excited about. She texted me at 2300 to say so). 4) Made three table mats to make mealtimes easier to clean up (I’m kidding, we’re very genteel diners here) – the fourth is still waiting to be cut out, I should really do that today. 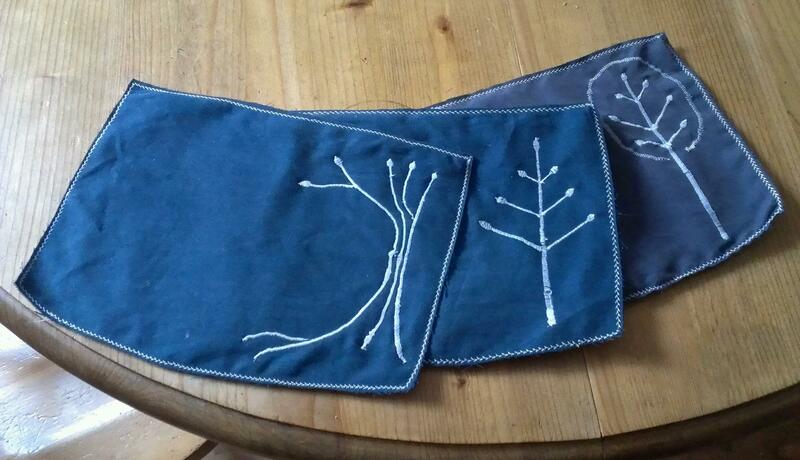 Trousers into Viking apron into placemats. Recycling win! 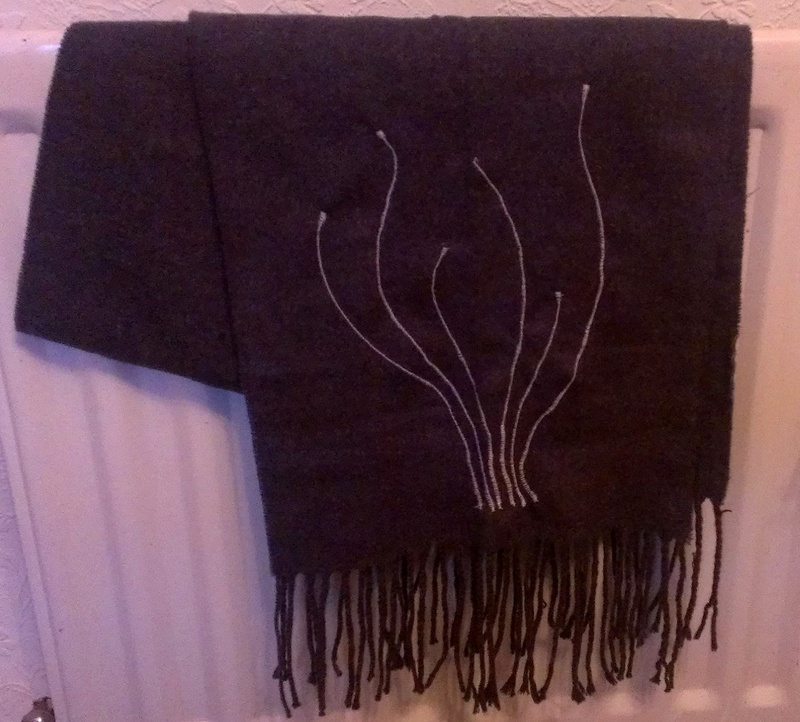 5) Embroidered a warm scarf to keep my partner snuggly on his cycle to work. 6) Embroidered a picture for someone I don’t know, as a Random Act of Kindness. There are reasons, it’s not actually that random, but that’s a whole other story that isn’t mine to tell. NOT TOO SHABBY, if I say so myself. But what I’d like to know is, what have *you* been doing? Have you kept your creative juices flowing, and unclogged by mundanity and chores? Has it been easy, or have you struggled? What did you last create, and when?